Bangalow Uniting Church in Australia. Chapter XIII, Historia Calamitatusm: The Story of My Misfortunes, Pierre Abélard / Peter Abelard, c. 1140. "Even those affections which are in themselves worthy of praise and commendation must be controlled and kept in order, so that godliness may have the upper hand and have preeminence." "Though the disciples of Christ are not all crucified, yet they all bear their cross, and must bear it in the way of duty." "How numerous are his children and servants!" Count the Cost, from The Poor Man's Portions, Robert Hawker, c. 1800. "The Christian is the salt of the earth; the savour is the spirit of self-sacrifice; if it is wanting his life is worthless." Commentary, Luke 14:25-33, David Schnasa Jacobson, Preaching This Week, WorkingPreacher.org, 2016. "Last week's pericope from Luke was set inside, namely, in the home of a Pharisee where Jesus had been having relatively intimate mealtime conversations and interactions." "What does the cross mean to you? You kind of have to figure that out before you can make sense of or preach on Jesus' statement..."
"So maybe, just maybe, these harsh words about 'cross-bearing' are a call to do what Simon of Cyrene did. Once he picked up the cross, it wasn't clear to anyone how the day would end. It was only clear that his future was bound up with the future of the poor, unfortunate person who could no longer carry the weight of the cross." Commentary, Luke 14:25-33, Emerson Powery, Preaching This Week, WorkingPreacher.org, 2013. "Today's contemporary Church has to wrestle with the reality of following a radical, counter-cultural prophet." "... more and more psychological research indicates that we actually value more highly those things for which we sacrifice." "To anticipate the preaching moment, this call to discipleship is radical, implying that those who follow Jesus are not going to be making decisions based on 'what’s best for me,' or even 'what’s best for our marriage/family/children'"
"How Not to Respond to an Evite," Alyce M. McKenzie, Edgy Exegesis, 2013. "We do not have what it takes, out of our own human resources, to see this sacrificial way of living through to the end. The good news is that God, working through Jesus, the Good Shepherd, helps us to persevere in the life of discipleship when our energy flags and our patience reaches its expiration date." "Leaving Home," Nancy Rockwell, The Bite in the Apple, 2013. "To learn, to encounter, to unravel mystery, to belong to God alone, all these require leaving, really leaving, in order to be open to the unexpected and unknown presence of God, who will be found not according to the rules, and not by the book, and not in the customary places, and not without fear, passion, deep prayer, and reflection on the strangers you have found each day, and the homelessness you have known." "The message that we are encouraged to give is one that is comfortable and in line with our culture. God is love, so relax. But Jesus turns this back at us, calling on us to count the cost." "Loyalty Is Overrated," Bruce Reyes-Chow, The Hardest Question, 2013. "When our faith must be bigger than family, friends, or saving face..."
Holy Textures, Understanding the Bible in its own time and in ours, Luke 14:25-33, David Ewart, 2013. "I have often thought that these words of Jesus may not make the faith we hold and follow seem very attractive. Why does he offer them then?" "Nothing and no one can compete with the demands of following Jesus." "First Thoughts on Year C Gospel Passages in the Lectionary" Pentecost 16, William Loader, Murdoch University, Uniting Church in Australia. "This passage offends against the values which most people hold dear." "On one hand, Jesus makes it very difficult to be his disciple. It will cost us everything and we need to know the cost before 'jumping' in. On the other hand, Jesus may be making it impossible to be his disciple on our own abilities? When we confess, 'I can't,' then we are open for God's 'I can.'" "Counting the Cost," Alyce McKenzie, Faith Forward, Patheos, 2010. "We are to count the cost before we commit." "Tower Building and Bible Software," Mary Hinkle Shore, Pilgrim Preaching, 2010. "Is Jesus like the guy who didn't do his math right before starting on that tower? Is he the neighbor with all the big ideas and whose yard is usually just a mass of plywood, mud and tarps?" "'Hate' should be understood in the contest of the first-century middle-eastern world. It is not so much an emotional position, but a matter of honor and shame..."
"Thin the Crowd," Doug Pagitt, The Hardest Question, 2010. "What does this story tell you about your story and the story of Jesus that are perhaps different than you assumed?" Kairos CoMotion Lectionary Discussion, Luke 14:25-33, Wesley White. "A place of conversation regarding Progressive Christianity." "None of you can continue learning or growing in experience of G*D through me if you allow your possessions to possess you." Wellspring of the Gospel, Ordinary 23, Catherine McElhinney and Kathryn Turner, Weekly Wellsprings. "What Makes a Disciple?" Larry Broding's Word-Sunday.Com: A Catholic Resource for This Sunday's Gospel. Adult Study, Children's Story, Family Activity, Support Materials. "List the qualities that define someone as a Christian. What is the most important quality? Why?" "The Cost of Being a Disciple," Rev. Bryan Findlayson, Lectionary Bible Studies and Sermons, Pumpkin Cottage Ministry Resources. "But to Bring a Sword," wikipedia. Brisson, Carson, "Luke 14:25-27, Between Text and Sermon" Interpretation, 2007. Derrett, J. Duncan M., "Nisi Dominus Aedificaverit Domum: Towers and Wars (Luke 14:28-32)," Novum Testamentum, 1977. Samra, James G., "A Biblical View of Discipleship," Bibliotheca Sacra, 2003. Wollenberg, Bruce, "Summoned," The Christian Century, 2004. "The Cost of Discipleship," Pastor Edward F. Markquart, Grace Lutheran Church, Seattle, Washington. "No Joy for Those Unwilling to Accept the Cost," the Rev. John Thomas, Day 1, 2004. "Counting the Cost,"\ Charles Kirkpatrick, Sermons4kids.com. "What Does It Mean to Follow Jesus," Sunday School Lessons: Family Bible Study, art projects, music, stories, etc. "A Costly Business," David Winfield, dramatix. "The Missions Drama," Matthew Pole, Christian Drama and Mime. 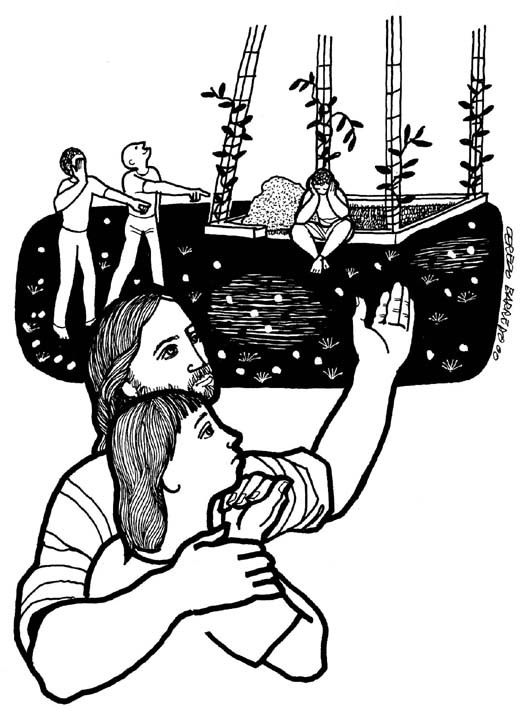 Clip Art, Luke 14:30, Fr. Richard Lonsdale, Resources for Catholic Educators. Luke 14:25-33 at Cerezo Barredo's weekly gospel illustration. Liberation emphasis. Hymns with Scripture Allusions: Luke 14:33. The Cyber Hymnal.